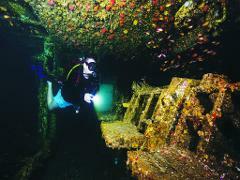 Dive one of the world's best wreck sites, the Ex-HMAS Brisbane. 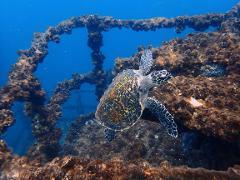 Located less than 3 miles offshore, this decommissioned guided missile destroyer now serves as an artificial reef and home to many marine animals. 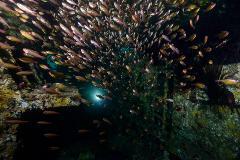 Diving a wreck at night is a unique experience for all divers. 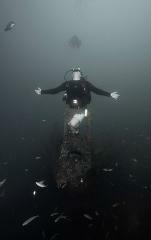 Not only does the Ex-HMAS have a different feel, but different residents also appear. These nocturnal animals come out, feeding and frolicking in the darkness of the night. Working with Canon, you'll learn how to get the most out of your underwater photography. Ask any photography questions to a Canon representative before, during, and after the dive. 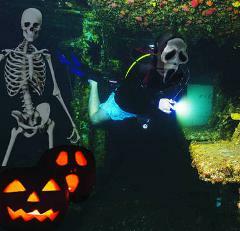 Join us for a special Sunreef Dive Club event for some Halloween fun - dress up in your scariest best to dive the Ex-HMAS Brisbane at night. We will have glow sticks on hand and prizes for best dressed to be won! Celebrating all things for women divers! PADI Women's Dive Day at Sunreef is bringing ladies together for an awesome afternoon of diving, eating and drinking to celebrate the girls who dive.